It’s very common today, in the general excitement for World War One digitization projects springing up like mushrooms, to realize how many diaries were still in chests of drawers or in the attics of Europe. In theory, we should give equal importance and consequently equal attention to the discovery of a new World War One diary belonged to an unknown farmer who lived in the middle of nowhere, somewhere in the Dolomites, and to the unlikely discovery of a forgotten diary belonged to the Italian poet Giuseppe Ungaretti. In other words, what diaries and journals can reveal is not depending on the celebrity of the person they belonged to. This is quite obvious, but it makes sense to stress this point once again before going on. Notwithstanding what we just stated, we cannot but emphasize the news that recently came from the Cambridge University Library, the institution that conserves the richest collection of Sassoon's manuscripts and archival papers, about the digitization now made available online of “23 of Sassoon's journals from the years 1915-1927 and 1931-1932, and two poetry notebooks from 1916-1918 containing rough drafts and fair copies of his war poems”. 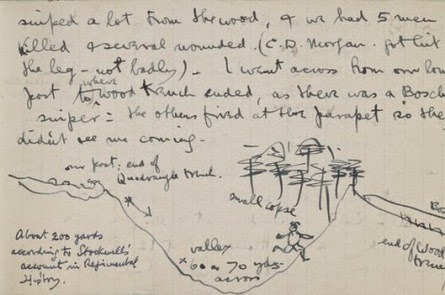 And if we all know the poet and his popular memoirs (the “trilogy” composed by Memoirs of a Fox-Hunting Man, Memoirs of an Infantry Officer and Sherston's Progress), it’s meaningful to remember that Siegfried Sassoon kept a diary for the most of his life, so also during peace times. While considering this, the fact of keeping a diary during the war becomes to our eyes a kind of routine activity moved on a new scenario that is not sharing anything with a common "daily routine". Besides this simple realization, we can foresee a mutual exchange between diaries and journals on one side, and poems and autobiographical texts on the other. The benefits of this commendable project and the real pluses of digitization are a new breathing database that allows “the viewer to form a thorough sense of the nature of the physical documents.” For Sassoon the war notebooks are like a comrade and like a friend, where to entrust all aspects of the trench life (drawings, notes, briefs, diagrams, places, poetry, letters). To surf among the pages is really like getting closer and closer to that time; your journey through Siegfried Sassoon’s diaries could start here.